There are a ton of different Wii accessories, and in order to keep them in as good of shape as possible using plastic or silicone skins is a great idea. They work to keep the accessory clean, and adds a bit of protection in the case that it flies out of the hand. There are three very common uses for Wii skins; the WiiMote, Balance Board, and console skins. Let’s break down some of the best in each of these categories so you only have to buy them once! All new Nintendo Wii systems will come with a generic skin for the WiiMote. Those with older systems can request them on Nintendo’s website, and have them sent to you for free. The problem with those skins is that they are absolutely boring! Third party manufacturers are making skins that are as creative as your Mii character! Colordrives makes a set of skins for the WiiMote and the Nun Chuk that has a blue, green, pink, and orange skin in it. This works great when you’re playing multiplayer and having to keep everyone’s controllers straight. For Wii Fit and other games that require the Balance Board, having a silicone skin on the board is extremely helpful. They do not affect how the Balance Board reacts to your movements and do a fantastic job of improving traction on the board. Anyone who has done long runs in Wii Fit know that it gets slippery after a while! An added advantage of the skin is that it also keeps the board underneath clean and in great shape. Adding a vinyl skin to the console itself is one of the coolest ways to show your creativity. These are extremely easy to apply, it’s really just a sticker that’s cut to fit around all of the buttons, vents, and feet of the Wii. There are dozens of different designs available. For an old-school look, check out the Retro Revolution design by MyGift. This skin turns your Wii into an original NES system! If you want to take it all to the next level, there is also the Nintendo Wii Console Skin with “E” Shock that is a triple thickness vinyl that will help protect your Wii from impact. Wii skins are both useful and creative. 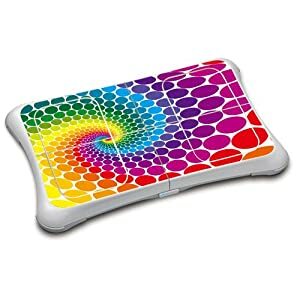 There isn’t a better way to express your style on your Wii than with a skin for the console, or to help yourself stay safe with the silicone skins for the WiiMote and Balance Board.